We had spent almost a week on the Santa’s Road, driven more than 400 km from Rovaniemi, and was now at border to Norway. This is also the border between the European Union and Norway. Different regulations, products and prices create business opportunities. Norwegians love shopping just inside the Finnish border on many locations. Karigasniemi is one of these places. Karigasniemi is set by the river Inarijoki. A few kilometers further downstream it runs into Karasjohka to create the massive Teno or Tana river. The mighty salmon river. It was a few kilometers downstream the Tenojoki, at Rovisuvanto, that the Härkönen family came from. 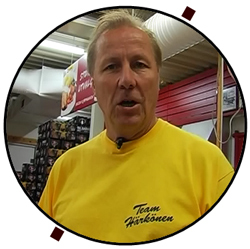 Mr. Seppo Härkönen has spent 40 years behind the counter. He has continued the proud traditions that his family started in 1950. Seppo was still young when the new store was built in 1979. In the autumn of 2014 they would add another service to their store. A liquor department was opened in September and Härkönen is expecting many more Norwegian shoppers will visiting their market. 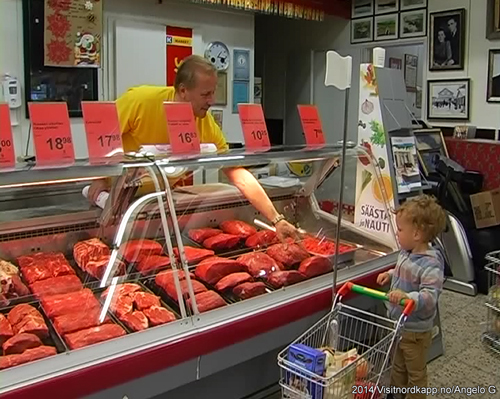 The trade and life in Karigasniemi is dependent upon the Norwegian customers. Mr. Härkönen explains that 95 % of the revenues are from their Norwegian neighbors. The favorite merchandise has been beer, tobacco, and meat. The Härkönen Market has a very fine meat selection. It has been rated as one of the best in Finland. 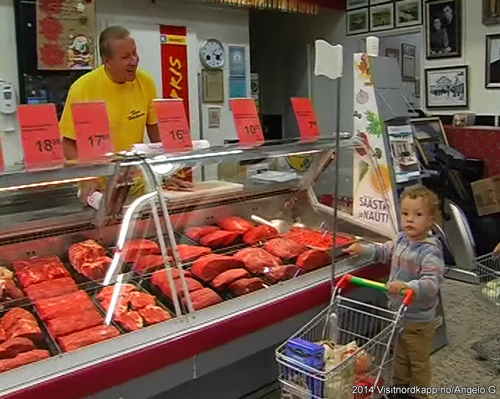 As we were speaking a very young customer came to the meat counter with his mother. Seppo raised both his hands, like he just scored a goal in an Ice Hockey match between Suomi Finland and Sweden. He said hello and asked the little kid what his wishes were on the day. No wonder Seppo won the prize for being the best business man in northern Finland in 2005. It is a remarkable achievement for a business from a small municipality like Utsjoki. They must have worked hard to get this kind of acknowledgement. This is where every trade is a match winner.